© 2002, © 2019 by Paul Freeman. Revised 4/14/19. 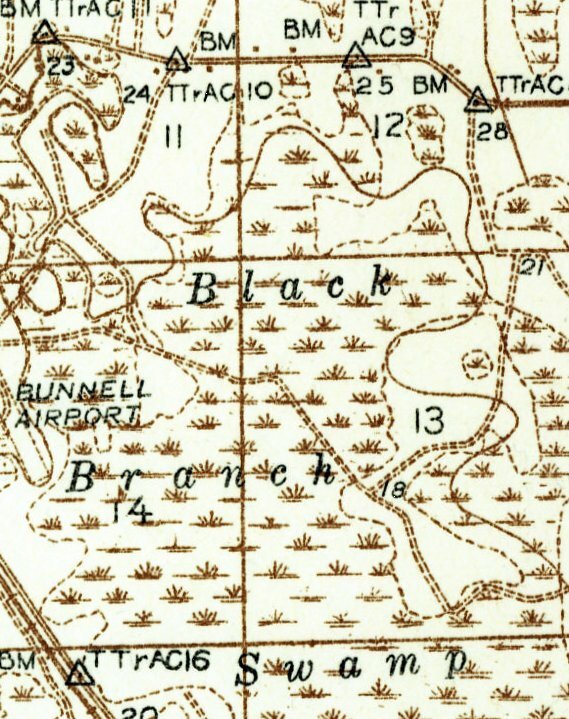 Bunnell Airport, as depicted (the circled “AP”) on a 1935 FL Road Department map of Flagler County (courtesy of University of FL Digital Collections, via Tom Duncan). using Federal Emergency Relief Administration (FERA) and Civil Works Administration (CWA) funds. The Flagler Tribune reported that approximately 40 men commenced clearing 100 acres of land owned by the town in southeastern Bunnell on 11/27/33, working 5 days/week. The land was being put in shape for a new municipal landing field usable by both light & heavy planes. The effort was coordinated with the Aviation Division of the State Road Department. Tom continued, “On 12/17/33, Okey & Martha Bevins landed on the new Bunnell Airport in their little Aeronca C-3 monoplane, becoming the first to use the still unfinished airfield. Most of that afternoon, the little plane was in use giving various Flagler County citizens their first air ride over Bunnell. A small fare was charged, one-half of which was turned over to the town to be used for construction of a hangar. Okey continued flying back to Bunnell throughout the Christmas holidays, and many more citizens went for aerial sightseeing tours of the town in his little plane. Bevins also offered to set aside a day for black members of the community to experience a plane ride. One of their community leaders, Will Johnson, was to organize a picnic near the airfield in conjunction with this. 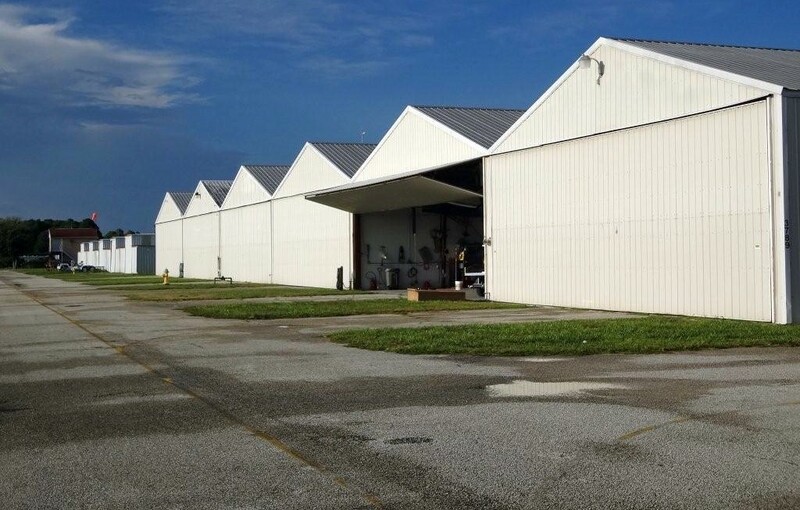 Tom continued, “Okey Bevins announced that he was planning to extend operations of his Flagler Beach flying school to include the new Bunnell Airport. Subject to suitable arrangements with the town, he would offer local flying lessons there for students there. 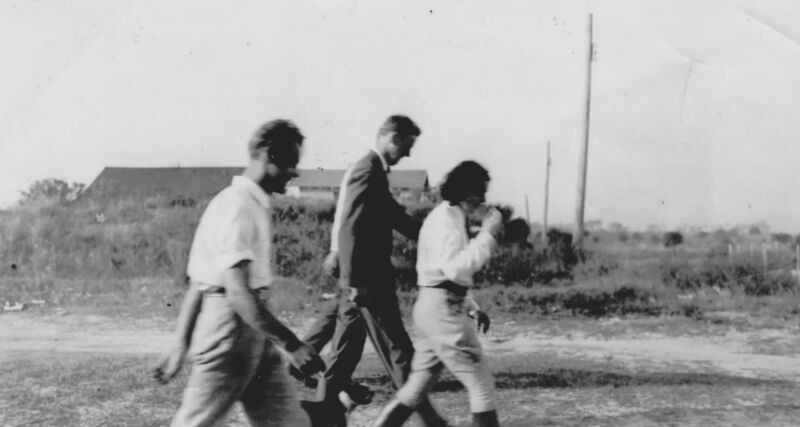 Harry Wymer, sales representative for the Aeronautical Corporation of America (Aeronca) in Cincinnati, flew from Orlando to Bunnell on 1/3/34 to inspect the new airfield. Tom continued, “On 5/19/34, the new airfield at Bunnell was inspected by Major A. B. McMullen, Aviation Director of the State Road Department. of the Flagler and Volusia County offices of the Federal Emergency Relief Administration (FERA). As a result of the inspection, McDonough appeared before the Flagler County Board of Commissioners to request County equipment to finish the construction. The County Commissioners agreed to provide a tractor, grader & other equipment as well as an operator, provided FERA cover the fuel costs. The completed airport was to have a 250' wide by 3,500' long runway. 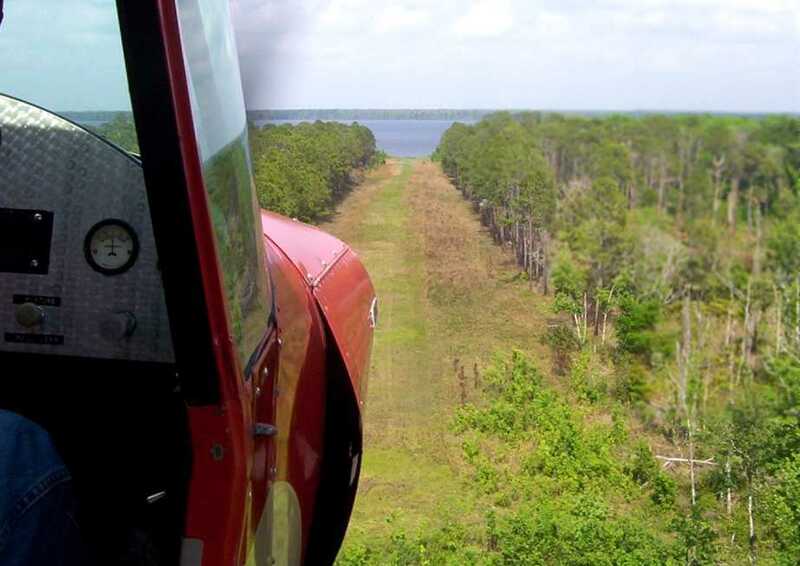 Luther Upson, Flagler County FERA Supervisor, stated that plans were active to provide boundary markers & a permanent wind sock at the airfield, items that Major McMullen considered urgent. 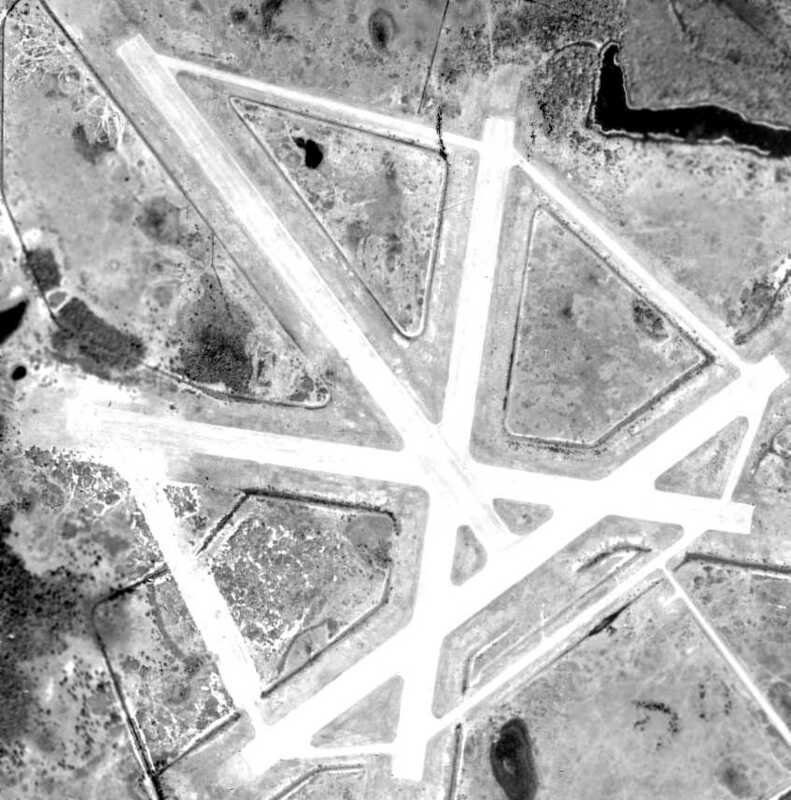 Upson also stated that FERA had approved a project for directional markings to the airfield at Bunnell. 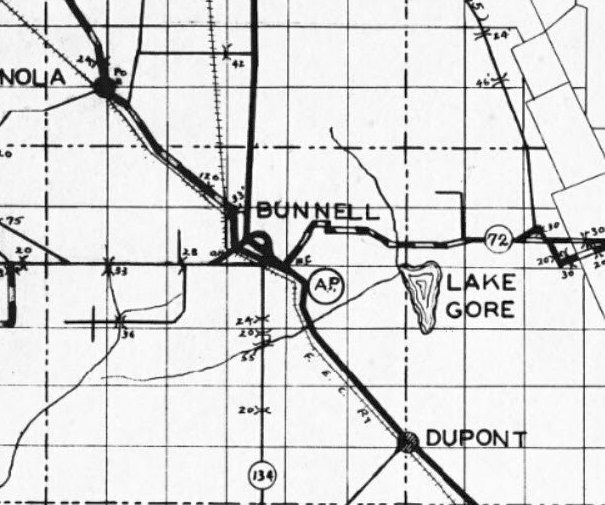 The earliest depiction which has been located of Bunnell Airport was on a 1935 FL Road Department map of Flagler County (courtesy of University of FL Digital Collections, via Tom Duncan). However, Bunnell Airport was not depicted on the 1935 Orlando Sectional Chart. The 1937 USGS topo map (courtesy of Tom Duncan) depicted Bunnell Airport as having a single unpaved northwest/southeast runway. 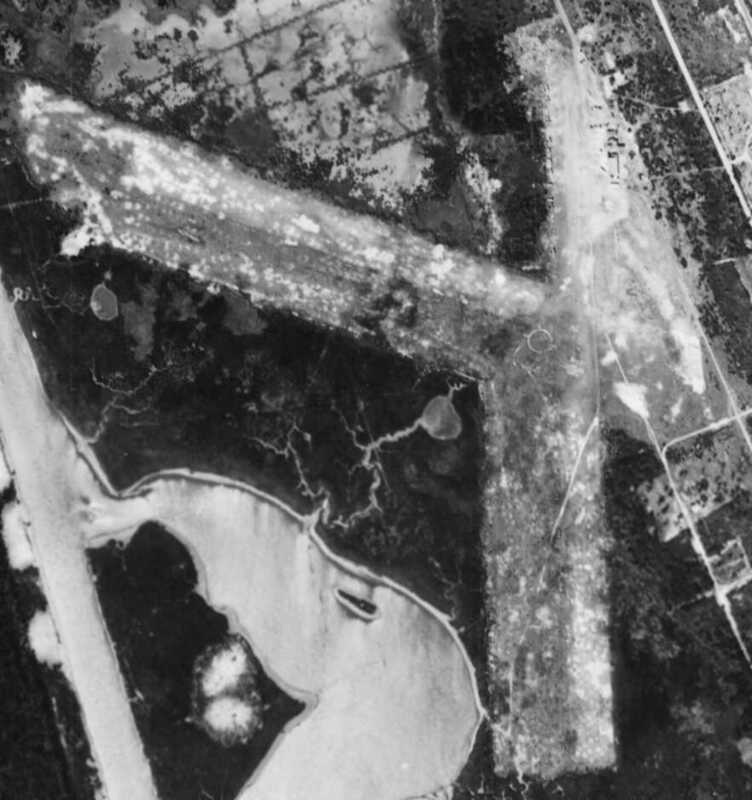 The earliest photo which has been located of Bunnell Airport was a 2/8/43 USDA aerial view (courtesy of The University of FL Map & Imagery Library, via Tom Duncan). with two 2' wide by 20' long panels extending from outside the circle along the runway centerline to indicate the landing directions. with the objective of immediately beginning daily air passenger service from Bunnell connecting with 35 other FL cities over 2 routes. There would be 2 stops/day at Bunnell, one 3-passenger plane each way. Gordon planned to meet with Bunnell business & civic leaders to discuss the airport facilities. He made it clear that the plan was contingent on what the local civic groups could or would do to improve the airport & make it suitable for passenger service. It was also contingent on military conditions permitting regular air passenger landings there. 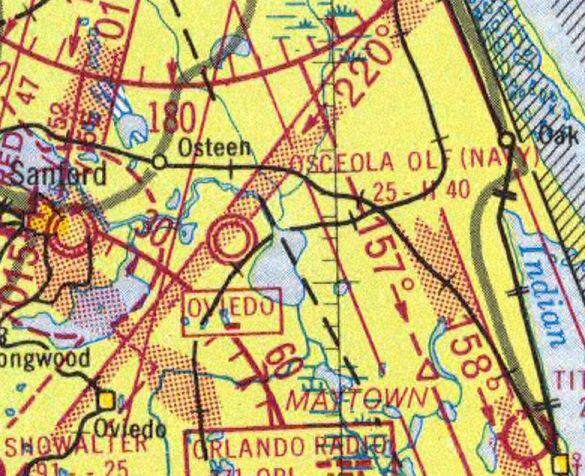 Bunnell Airport continued to not be depicted on the February 1945 Orlando Sectional Chart (or subsequent aeronautical charts). (courtesy of Sisco Deen, Flagler County Historical Society, via Tom Duncan). standing on the wing of his Fairchild PT-19 surplus WW2 primary trainer at Bunnell Airport as his wife, Johnnie Maxine Buckles Allen, is preparing to enter the rear cockpit. Tom reported, “While in the Army Air Corps during WW2, Lt. Allen was a Boeing B-29 Superfortress bomber pilot. 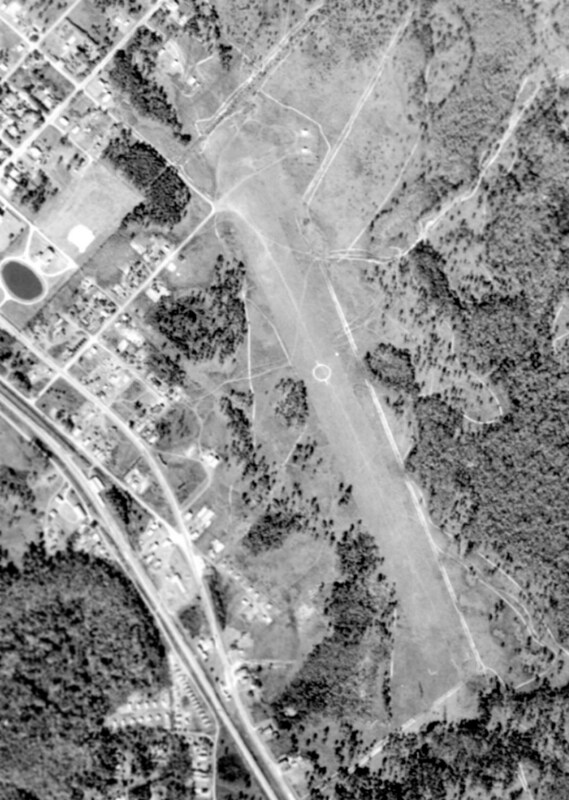 The last photo which has been located showing Bunnell Airport still intact was a 1/9/52 USDA aerial view (courtesy of The University of FL Map & Imagery Library, via Tom Duncan). Tom Duncan continued, “The grass field at Bunnell was in use to at least the late 1950s. Gloria McArn Deen recalls her uncle George Allen flying her from the Bunnell Airport in his Beechcraft Bonanza to Tallahassee where she attended FL State University. A 2019 aerial view looking northeast showed no recognizable trace remaining of Bunnell Airport. Thanks to Tom Duncan for pointing out this airfield. 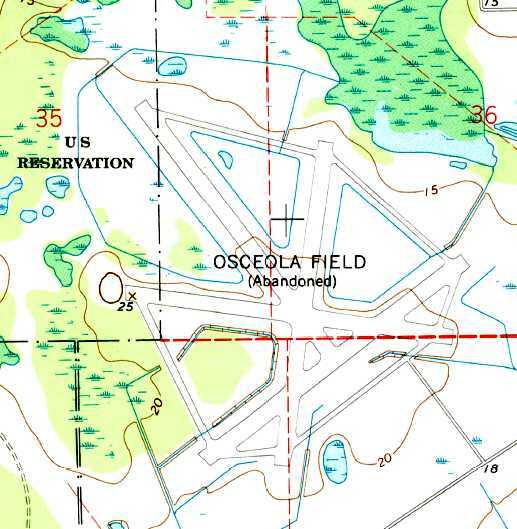 Green Pasture Airfield, as depicted on the November 1965 Orlando Sectional Chart. as it was not yet depicted on the 1962 USGS topo map. 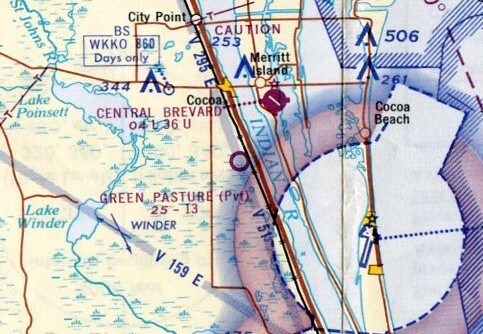 The earliest depiction which has been located of Green Pasture Airfield was on the November 1965 Orlando Sectional Chart. It depicted Green Pasture as a private airfield having a 1,300' unpaved runway. with a single small building on the southeast side. 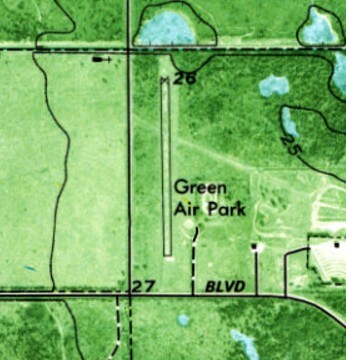 The 1976 USGS topo map depicted “Green Air Park” as a single paved north/south runway. There were no buildings depicted on the airfield. At various points, the airport was reportedly known as Shawnee Airpark or Rockledge Flypark. 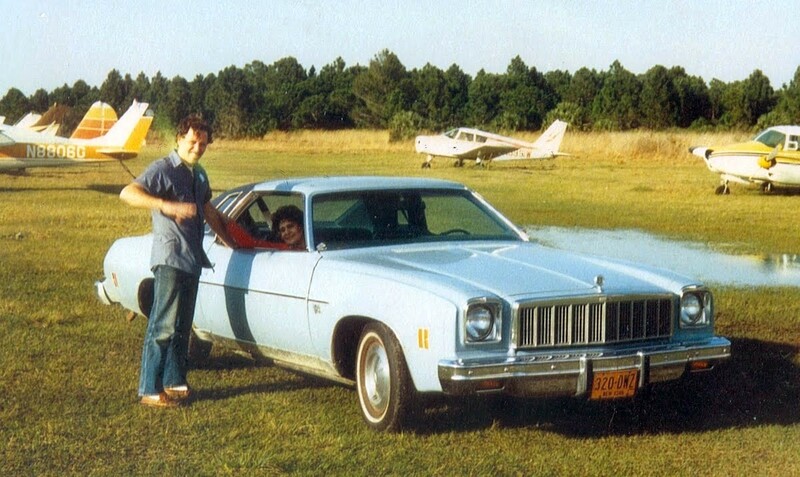 By the 1980s, the airport was owned by Billy Squires, and was known as Rockledge Airpark. Billy owned & flew a 1959 Piper PA-25 & a 1963 Cessna 172E. 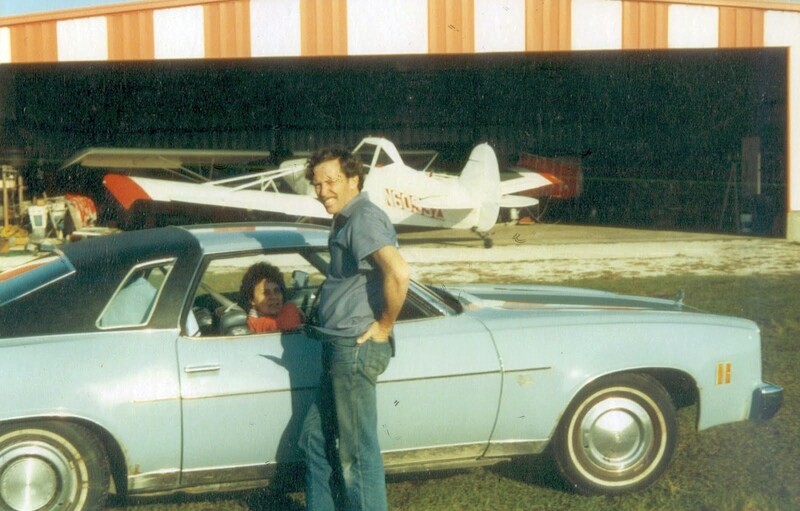 A circa late 1980s / early 1990s photo of Bills Squires at Rockledge Airpark, with his 1959 Piper PA-25 visible in the hangar in the background. A circa late 1980s / early 1990s photo of Bills Squires at Rockledge Airpark, with several light planes in the background. with a few small hangars on the west side, and a small hangar on the east side, outside of which was parked one single-engine light plane. A 2011 photo by John Rensing looking along Rockledge Airpark's runway. 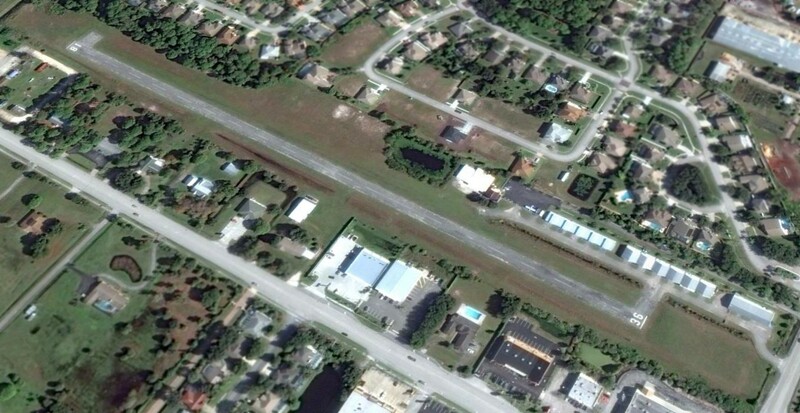 which had evidently been added to the southeast side of Rockledge Airpark at some point between 1994-2011. A 2011 photo by John Rensing of the office of a business operating out of Rockledge Airport: Aero Adventure which sells homebuilt aircraft kits. As of 2013, Rockledge Airport's FAA Airport/Facility Directory data described it as having a single 2,010' asphalt Runway 18/36. It listed the owner as Rockledge Airport Corporation, and the manager as Balz Feiner. which showed one single-engine light plane parked on the ramp on the southeast side. "My son, we would sit out here & watch them fly all the time and now it's, he asked my dad where did the planes go?" resident Jamey Orsborn said. which is hardly a safety issue, and basically sounds like an excuse to close the airport to allow more lucrative property redevelopment. “They are grounded for no reason,” Brevard County resident Erskine Brewington said. Brewington said he is friends with some of the pilots & they’ve been operating safely there for years. "They are flying their patterns right, they are landing right," Brewington said. 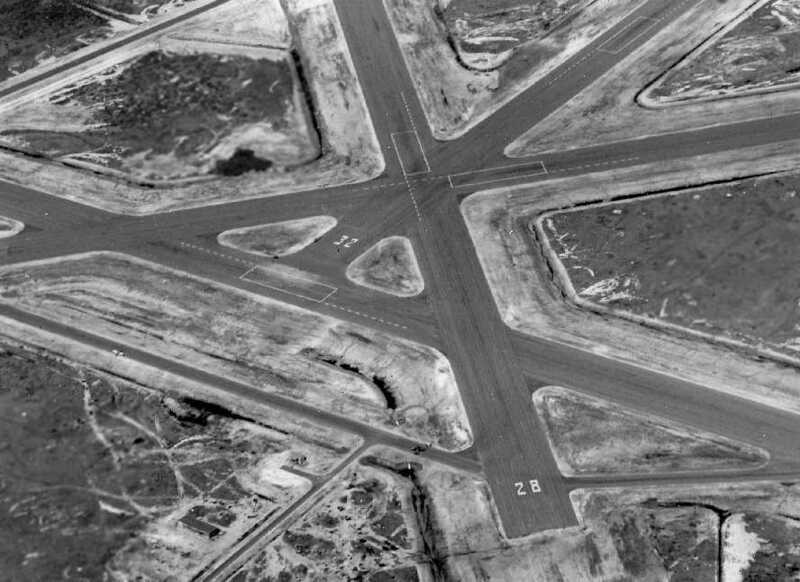 but devoid of aircraft, and with closed-runway “X” symbols marking the runway. What a shame to see this fine little grassroots airport going to waste. Thanks to Jess Sagalow for pointing out this airfield. 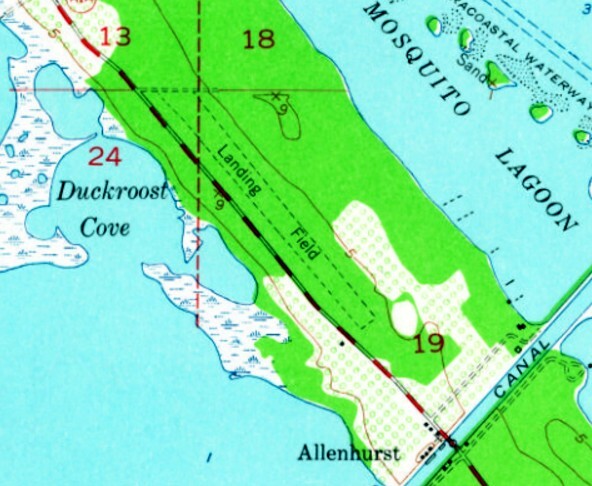 Haulover Canal Airfield, as depicted on the 1949 USGS topo map. 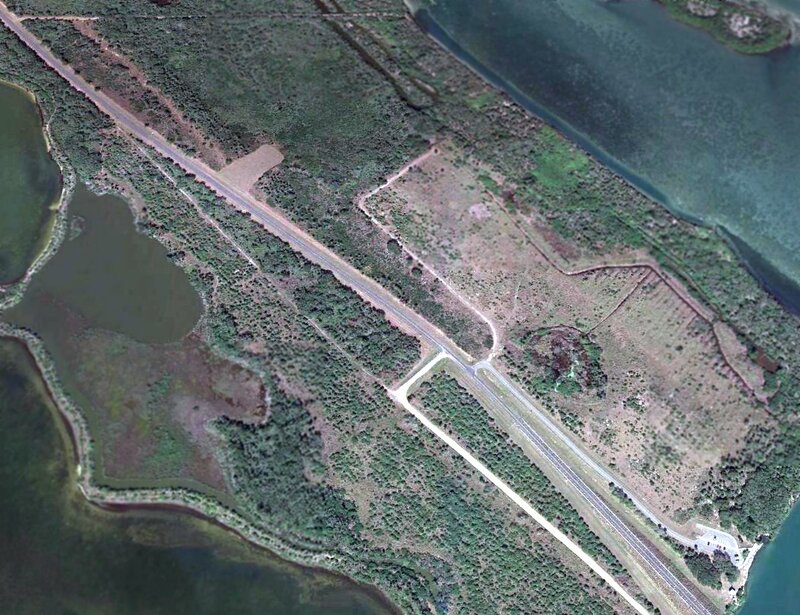 This little general aviation airfield was located along a narrow barrier island on Florida's coast. 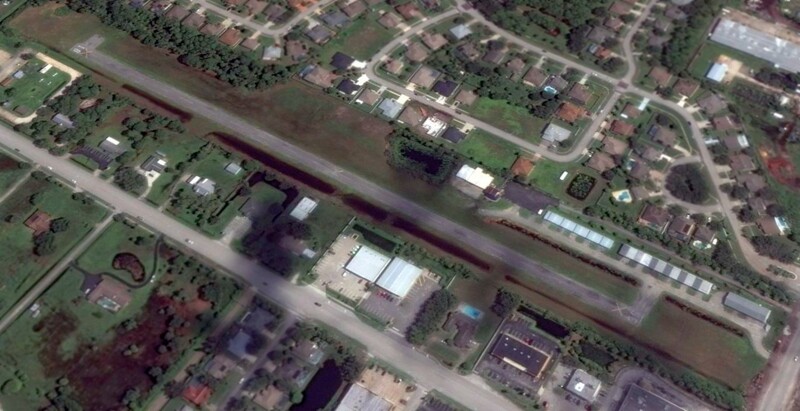 The date of construction of Haulover Canal Airfield has not been determined. 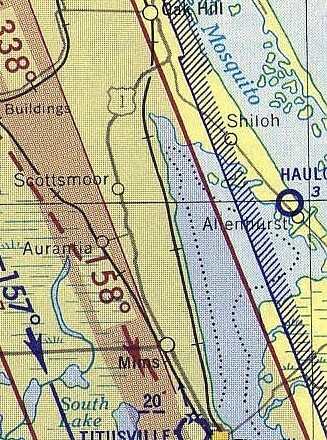 The earliest depiction which has been located of Haulover Canal Airfield was on the 1949 USGS topo map. 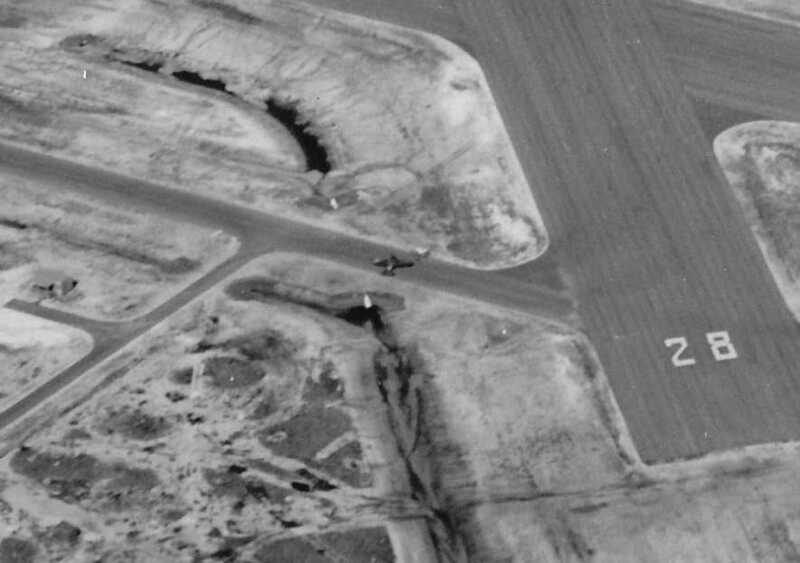 It depicted a single unpaved northwest/southeast runway paralleling the east side of the road, labeled simply as “Landing Strip”. There were no buildings or other improvements depicted. “Haulover Heights was located on the northeast side of SR#3 & had a 3,800' airstrip until the early 1960s. a station wagon would be picking up the passengers. 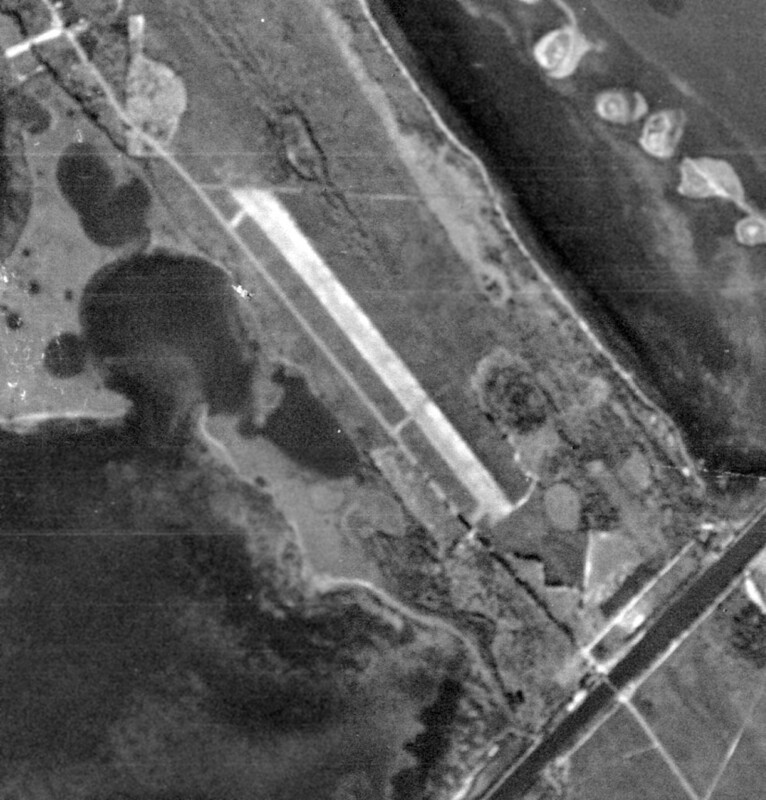 The only photo which has been located of Haulover Canal Airfield was a 12/19/50 USGS aerial view. 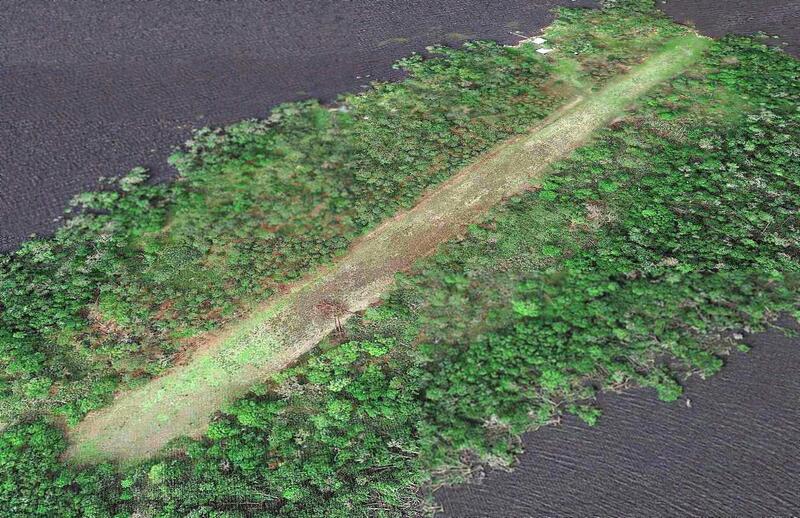 It depicted a single unpaved northwest/southeast runway paralleling the east side of the road. 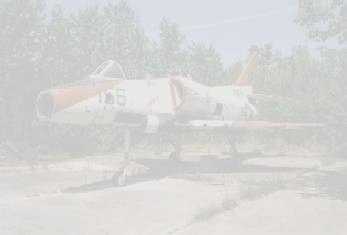 There were no buildings or other improvements depicted, nor any aircraft visible. was on the 1952 Orlando Sectional Chart (unfortunately cropped). 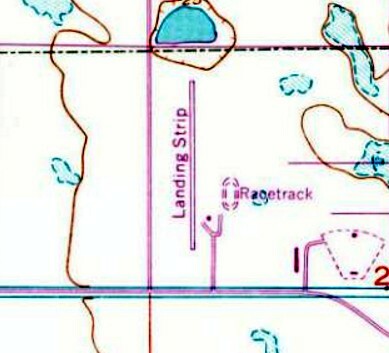 Haulover Canal Airfield, as depicted on the 1958 USGS topo map. 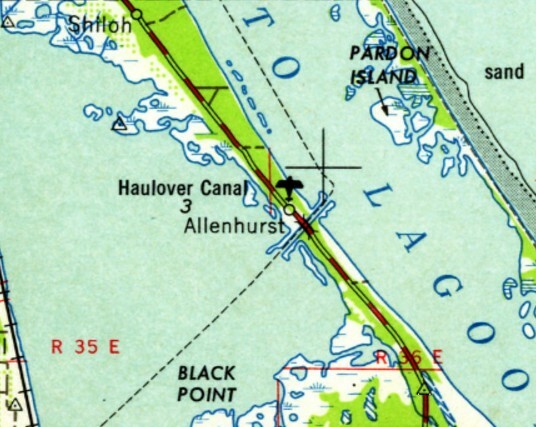 The 1962 USGS topo map depicted Haulover Canal Airfield in the same fashion. According to Robert Wark, “In the early 1960s, NASA bought all the land on north Merritt Island in Florida to create the Kennedy Space Center. as the 1970 USGS topo map showed State Route 3 had been rerouted over the southern half of the former runway. 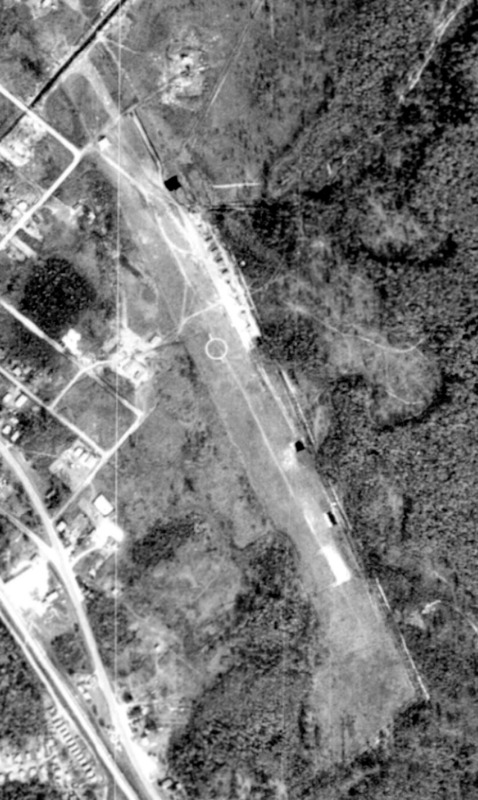 but the northern portion of the runway was still recognizable. Thanks to Robert Wark for pointing out this airfield. 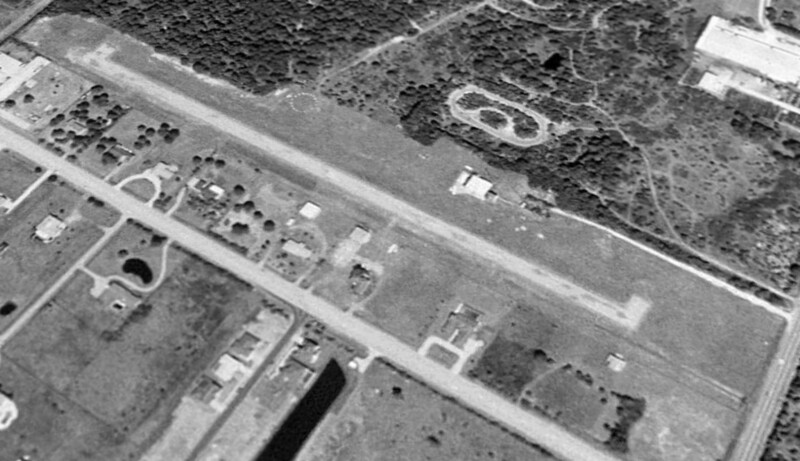 The Bear Island Airfield, as depicted on a 10/13/69 USGS aerial photo (courtesy of Dallam Oliver-Lee). This unusual little airfield takes up almost the entire length of Bear Island, in the middle of Crescent Lake. as it was not yet depicted on a 1/29/64 USDA aerial photo (courtesy of Dallam Oliver-Lee). 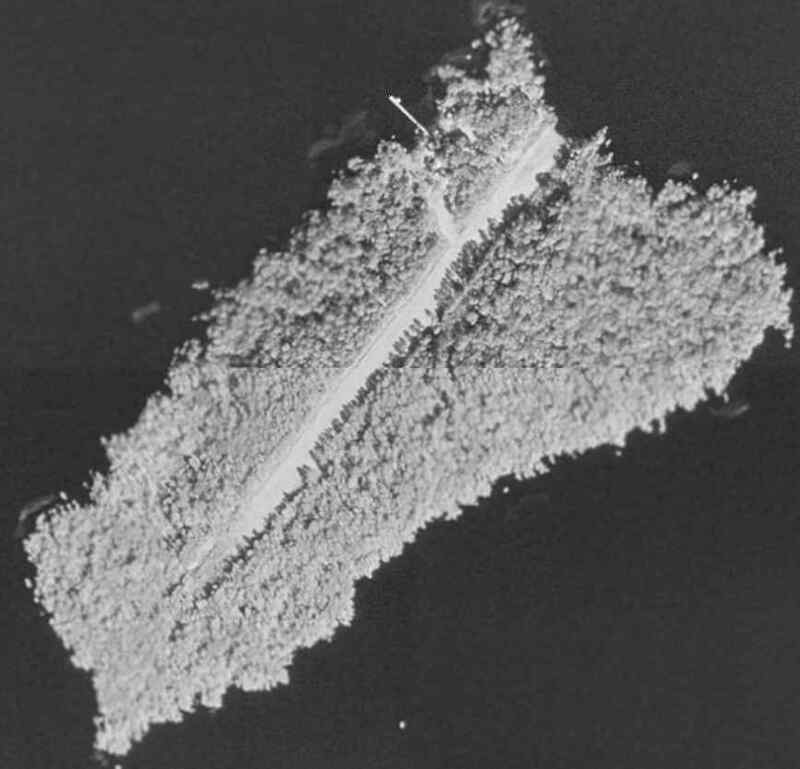 The earliest depiction which has been located of the field was on a 10/13/69 USGS aerial photo (courtesy of Dallam Oliver-Lee). running almost the whole length of the island. The runway may still have been under construction at the time of the photo. 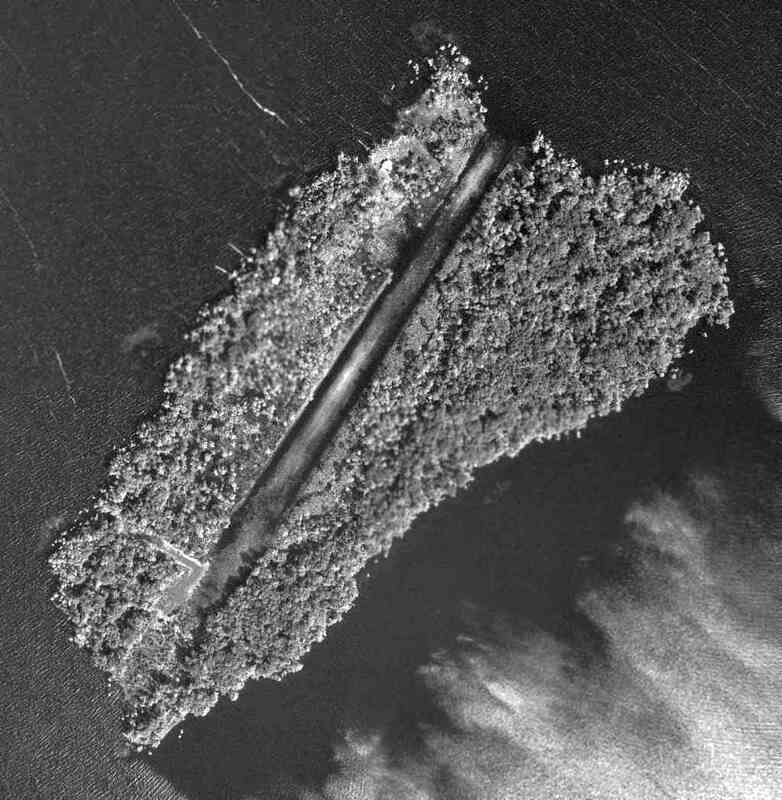 A 1970 aerial photo (from the U of FL Libraries) depicted the Bear Island runway somewhat more distinct, possibly after construction was completed. 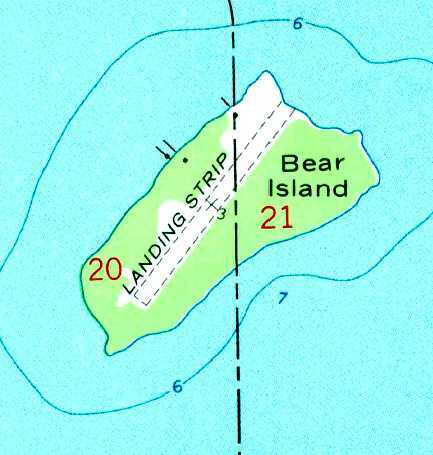 The 1972 USGS topo map depicted a single northeast/southwest runway, labeled simply as “Landing Strip”. 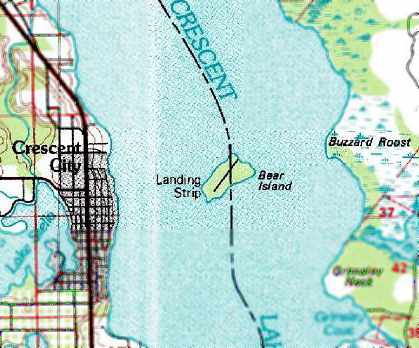 The 1978 USGS topo map depicted a single northeast/southwest runway, labeled simply as “Landing Strip”. along with what may have been a residence on the north side of the island. The airfield was presumably a private field for the residence. The only photo which has been located of an aircraft on Bear Island was a spring 2004 photo by Jeff Ellsworth of his friend & his Murphy Rebel. Jeff recalled, “After landing, we walked off the length of the runway & estimated it to be 900'. My Murphy Rebel... only used about 300' of the 900'. A 2004 aerial view (courtesy of Dan Guerra) looking northeast at the Bear Island Airfield. A 3/20/04 aerial view by Philip Pecoulas looking northeast at the Bear Island runway from a Piper PA-12 Super Cruiser. nor any listed among the FAA Airport/Facility Directory data. 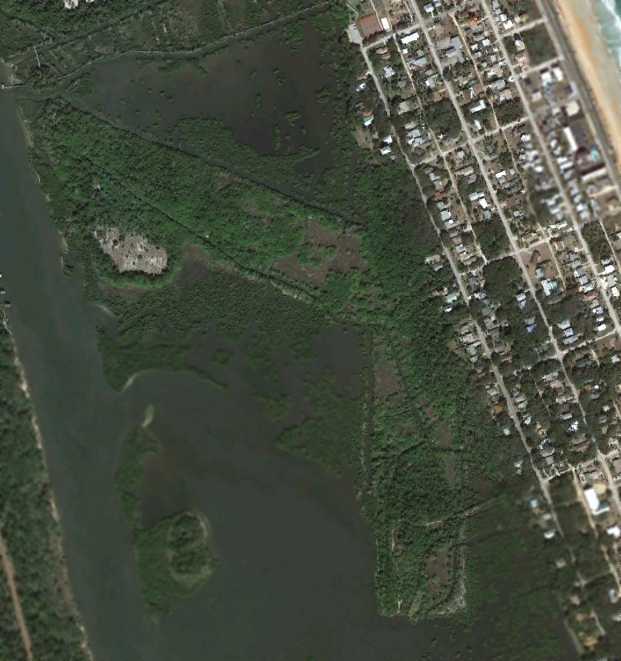 In contrast to the earlier reports of the runway being overgrown, a 2018 aerial view looking north showed the Bear Island runway to be very distinct & cleared. A circa 1929 photo of a biplane taking off from the unfinished Flagler Beach Airport (from the Flagler Beach Historical Museum, courtesy of Tom Duncan). “In May of 1929 the Flagler Beach Town Commissioners began exploring the establishment of an emergency aviation landing field. and by the end of the year it was nearly complete. of a biplane taking off from the unfinished airport (from the Flagler Beach Historical Museum, courtesy of Tom Duncan). A circa 1930 aerial view looking northeast at the Flagler Beach Airport (from the Flagler Beach Historical Museum, courtesy of Tom Duncan). A November 1931 photo of spectators gathered in front of Charles Lindbergh's Army Curtiss Falcon biplane at the Flagler Beach Airport (from the Flagler Beach Historical Museum, courtesy of Tom Duncan). The article continued, “Two years later, one of the most famous aviators of all time would make an unexpected landing there. On Saturday, 11/28/31 Colonel Charles Lindbergh left Miami before daylight in a borrowed U.S. Army airplane on a flight to New York. 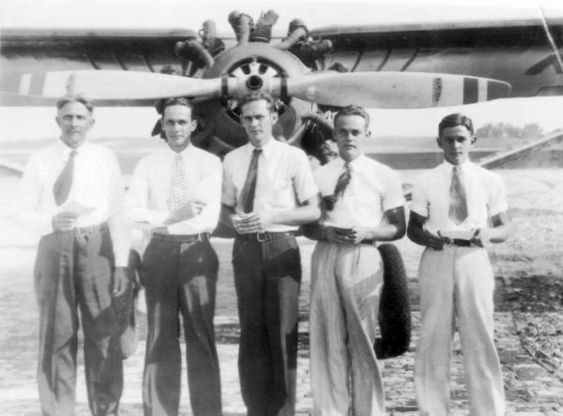 While flying over Flagler Beach Lindbergh noticed the airfield & about 15 miles north of town he encountered dense fog. Colonel Lindbergh turned around & landed on the grass runway at the Flagler Beach Municipal Airport at 9:15 am. The Army airplane was larger than the aircraft that normally used the airfield & immediately attracted the attention of local residents. When asked by Dewey Moody, Lindbergh admitted his identity & told residents that he expected to leave by 10:30 am. The news spread quickly that he was at the airport & other local residents went there to greet him. and Colonel Lindbergh took up one of their 2-cylinder Aeronoca airplanes for 2 short flights. Afterward he posed for pictures with local residents & then the Bivens took him to the Flagler Beach Hotel for his second breakfast of the day. visitors began to arrive from Daytona Beach, St. Augustine, and Jacksonville. He became more reticent when confronted by the crowds of people trying to get a glimpse of him. The article continued, “By Monday morning the weather had cleared & Colonel Lindbergh began preparing his aircraft to resume the flight to New York. Several groups of people flew in from Daytona Beach to see him off. It was noted that Mr. Bivens assisted him with the safety checks on the aircraft. Colonel Lindbergh said that he enjoyed Flagler Beach & would like to return for a longer stay. After shaking hands with those present at the airport, he climbed into the airplane & took off flying south for a short distance. after they all received their pilot’s licenses at Flagler. Pictured are: Luther Upson, Lawrence Upson, Louis Upson, John Upson, and Reginald Upson, in front of an unidentified high-wing monoplane. described Flagler Beach as a municipal field having 2 sod runways under construction: 3,200' northwest/southeast & 3,000' north/south. According to the Flagler Beach Historical Museum, Amelia Earhart landed at the Flagler Beach Airport in the early 1930s. 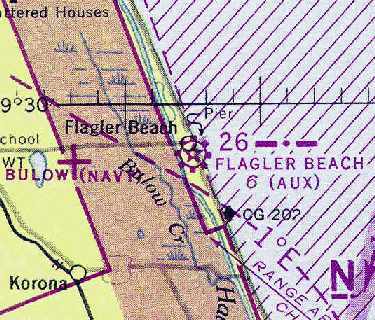 The earliest aeronautical chart depiction which has been located of Flagler Beach Airport was on the 1935 Orlando Sectional Chart (courtesy of Chris Kennedy). 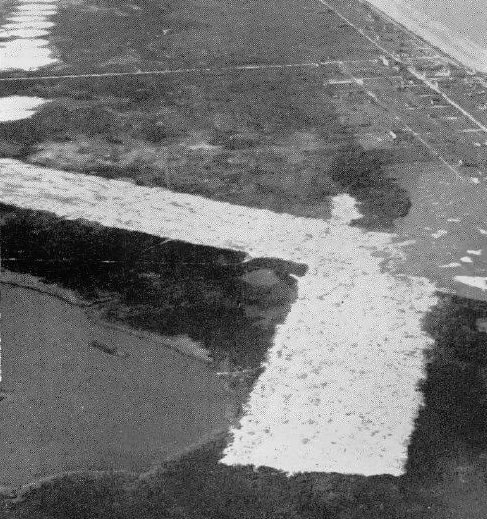 It depicted Flagler Beach as an auxiliary airfield. with a beacon on the northeast corner. An undated aerial view looking northeast at Flagler Beach Airport, from the 1937 WPA publication “America Spreads Her Wings” (courtesy of Tom Duncan). According to Tom Duncan, Civil Air Patrol (CAP) Coastal Patrol Base 5 operated at the Flagler Beach Airport starting on 10/28/42. as having 2 grass runways, with an airport circle marking at the intersection. A dozen light aircraft were parked along the northeast side of the field, near some small buildings. Tom Duncan observed that this “is the airport configuration as it existed for the Civil Air Patrol (CAP) Coastal Patrol Base 5. Those are the CAP patrol aircraft lined up on the field & the buildings include the Main Operations Building & hangar. The long building on the south end is the aircraft hangar housing the CAP engineering department. 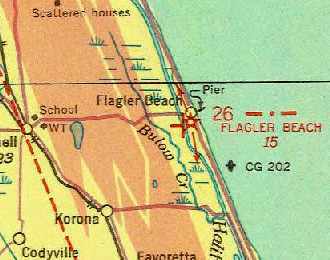 "Flagler Beach (Aux)" was depicted as a municipal airport on the July 1943 Orlando Sectional Chart (courtesy of Chris Kennedy). 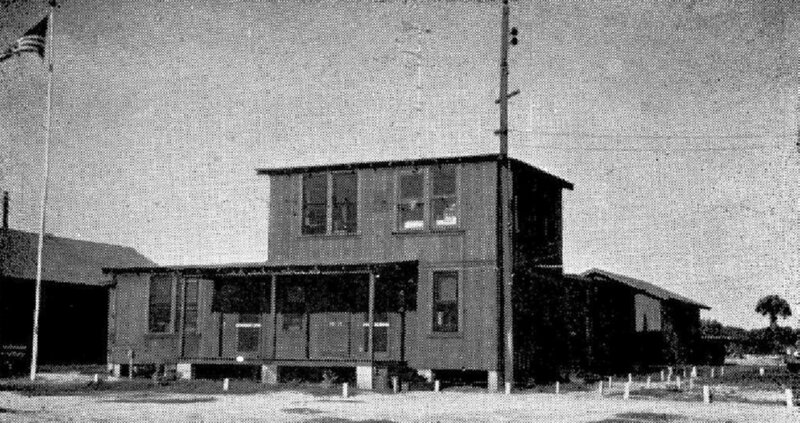 A 1942-43 photo of the Civil Air Patrol's Coastal Patrol Base 5 Administration Building built by the town of Flagler Beach as part of its lease agreement with the CAP (courtesy of the Flagler County Historical Society, via Tom Duncan). 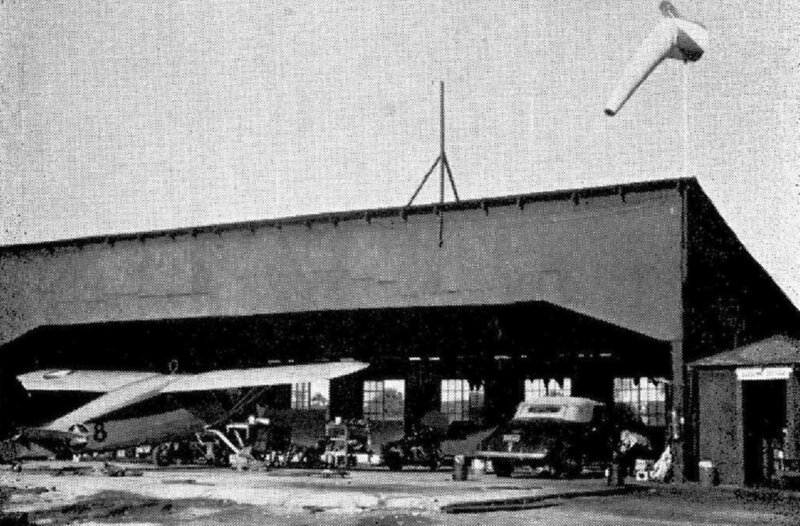 A 1942-43 photo of the Civil Air Patrol's Coastal Patrol Base 5 six-plane metal hangar furnished by the town of Flagler Beach as part of its lease agreement with the CAP (courtesy of the Flagler County Historical Society, via Tom Duncan). According to Tom Duncan, CAP Coastal Patrol Base 5 operated at the Flagler Beach Airport until 8/31/43. and indicated that the field conducted Civil Air Patrol Operations. 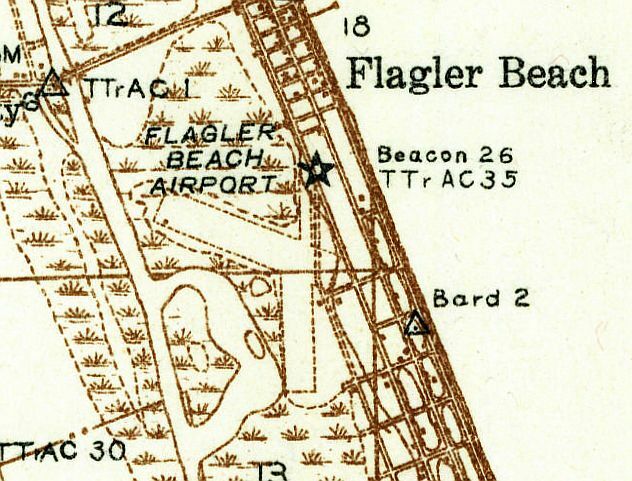 Flagler Beach Airport was still depicted on the 1944 USGS topo map. no longer depicted an airfield at the location, although its beacon was still depicted. but there did not appear to be any aircraft on the field. as having been built over the eastern edge of the site of Flagler Beach Airport. Nothing was depicted at the site of the airport on the 1960 USGS topo map. 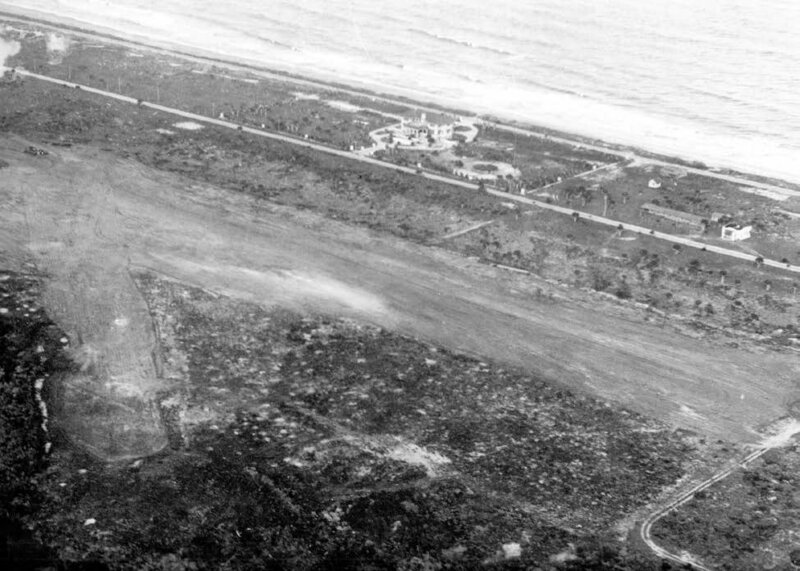 of the former Flagler Beach Airport remained almost completely intact. When this picture is compared with the 1943 aerial photo, it is amazing that the site has remained largely intact after 69 years. The site of the Flagler Beach Airport is located west of the intersection of Flagler Avenue & South 12th Street. A 3/15/44 U.S. Navy aerial view looking west at NOLF Osceola (courtesy of Brian Rehwinkel). which initially trained bomber crews, and later switched to training fighter crews. The earliest depiction which has been located of NOLF Osceola was on the 1943 Orlando Sectional Chart (according to Chris Kennedy). It depicted "Osceola (Navy)" as having a 4,000' hard-surface runway. 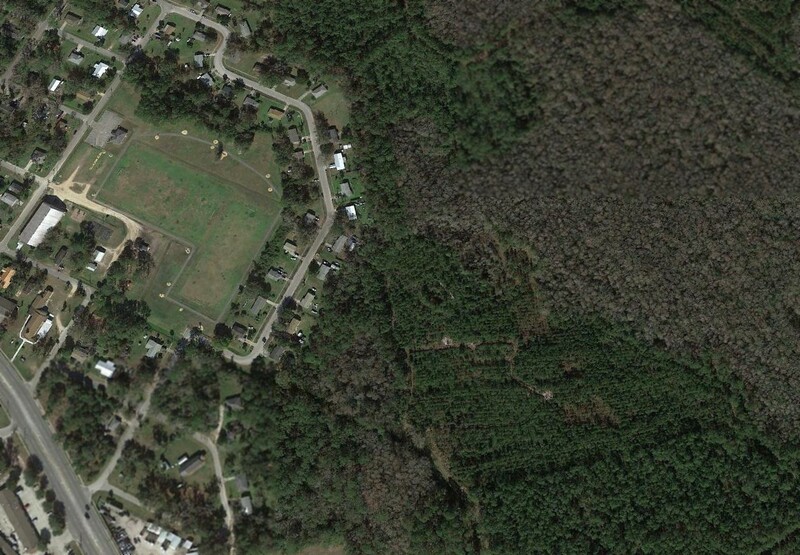 was a 3/15/44 U.S. Navy aerial view looking west at NOLF Osceola (courtesy of Brian Rehwinkel). 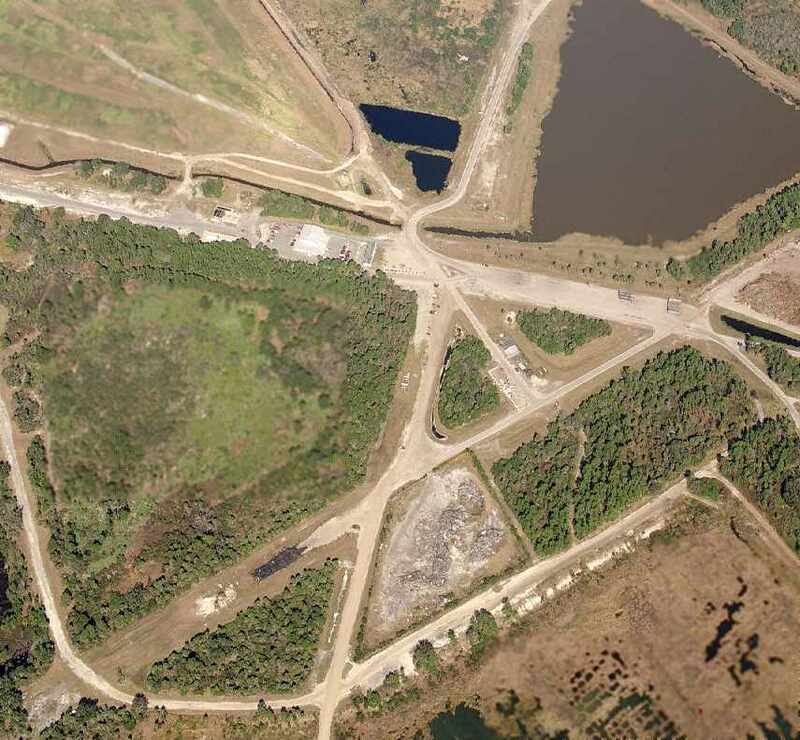 It depicted Osceola as having 4 paved runways, paved taxiways, and a few small buildings alongside the access road. showing a single low-wing single-engine aircraft on a taxiway on the north side of the field. 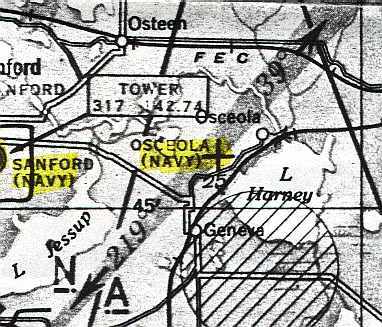 "Osceola (Navy)" was still depicted as an active airfield on the 1945 Jacksonville Sectional Chart (courtesy of John Voss). Osceola NOLF was declared surplus in 1946. It is not known if the field was ever reused for civilian aviation. 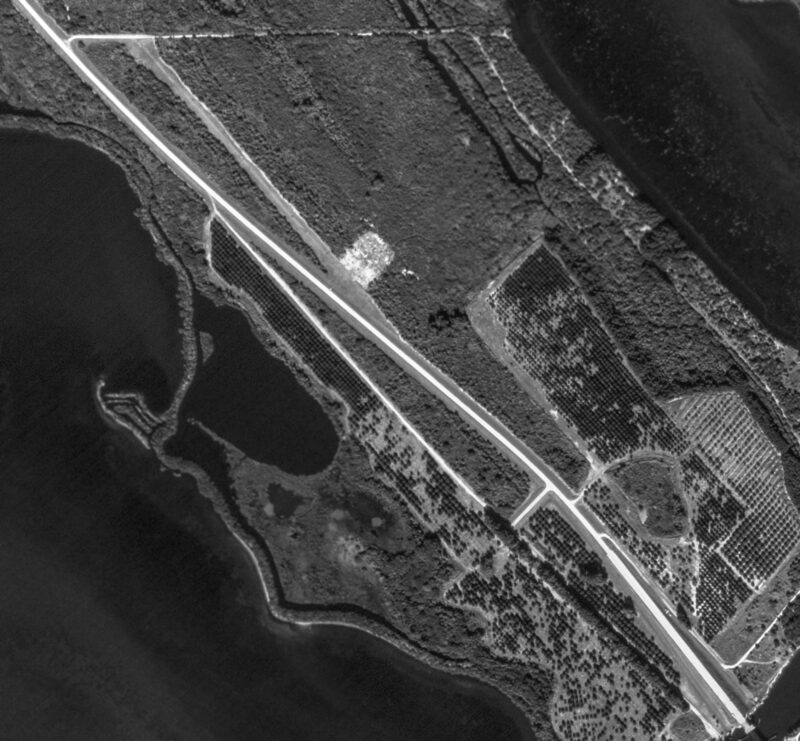 An 11/25/48 USDA aerial photo of Osceola NOLF, from the FL DOT (courtesy of Brian Rehwinkel). The airfield consisted of 4 paved 4,100' runways & taxiways. but it appeared abandoned - there was no indication of any current use of the airfield. There also did not appear to be any traces of any buildings at the site. but the Aerodromes table on the chart listed its status as "Closed, leased for grazing." The last aeronautical chart depiction which has been located of "Osceola OLF (Navy)" was on the 1956 FL Aeronautical Chart (courtesy of Roger Connor). 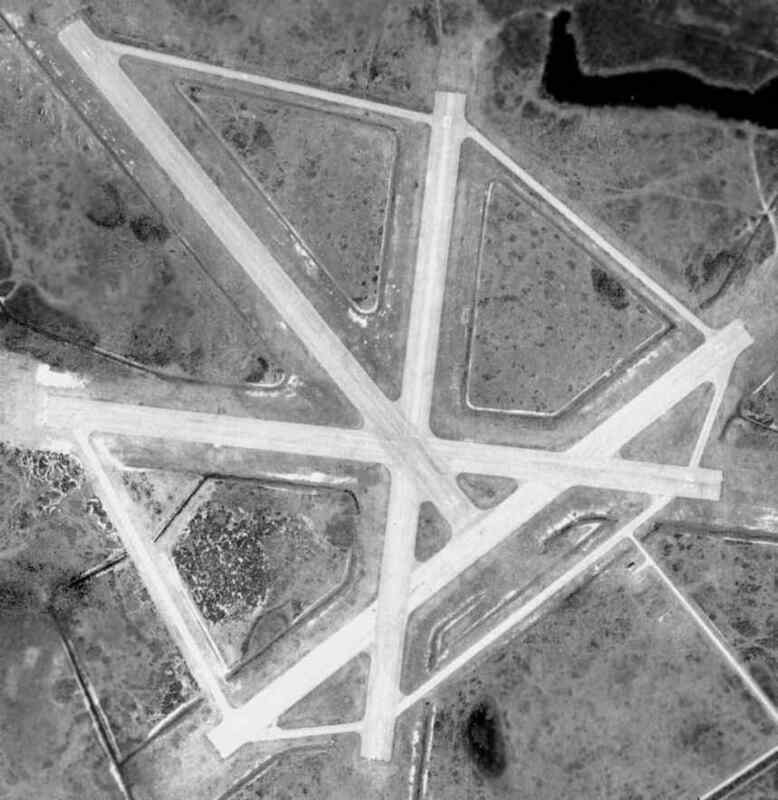 The last photo which has been located showing the Osceola airfield remaining intact was a 1958 aerial photo (from the U of FL Libraries). It would've made a nice municipal airport, if it had been located elsewhere. Al Fitzgerald recalled, “Osceola NOLF was used mostly as a drag strip & model airplane flying field when I knew of it in the early 1960s. I can remember landing there a couple times for the fun of it in a Mooney M21 around 1964-65. 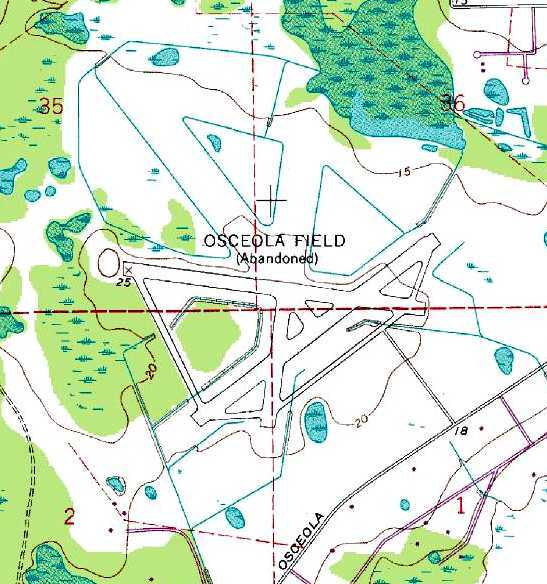 The 1966 USGS topo map still depicted the 4 intact runways & taxiways of “Osceola Field (Abandoned)”. drag races were held on the old airstrip every other Saturday night. That was from about 1961-67. In 1968 the SCCA held regional sports car races on the airfield. but the northern half had been removed at some point between 1966-88. Ross Burton recalled, “I did a lot of flight training down in the Orlando area. 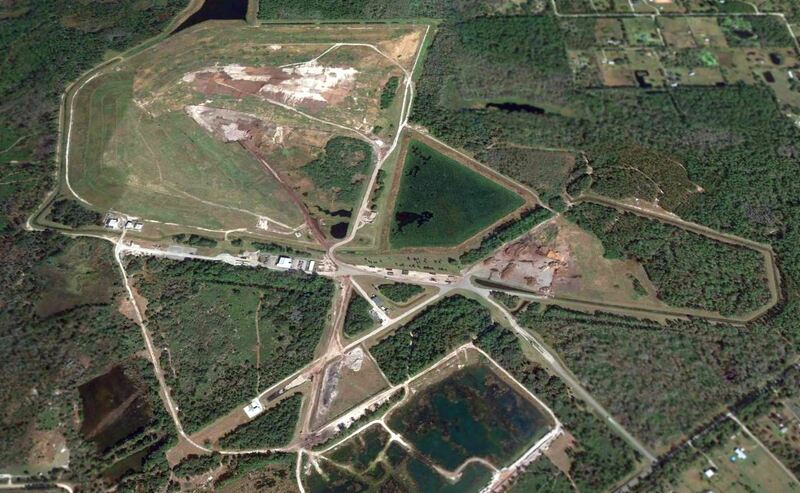 I had always wanted to know the origin of the abandoned airfield in Osceola. One day in 1991 we had a massive wind storm. 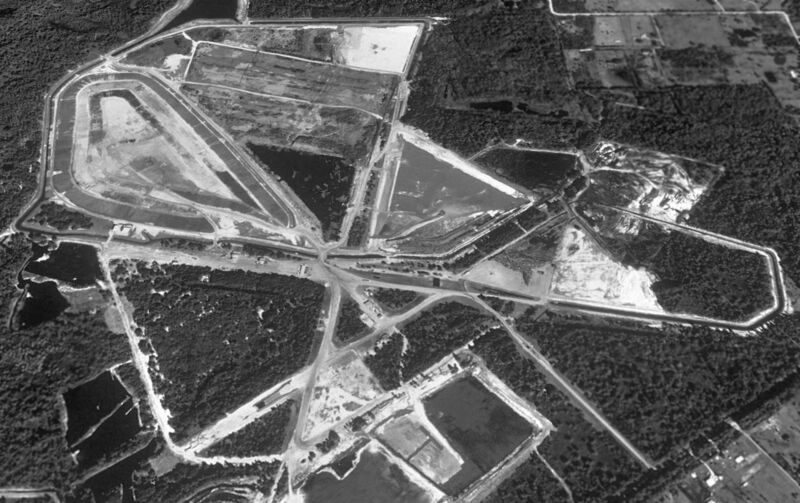 A 1995 USGS aerial view looking north at the site of Osceola Field showed that a significant proportion of the runways had been removed. with almost nothing left of the runways. showing that a shed had been built over the former east/west runway. 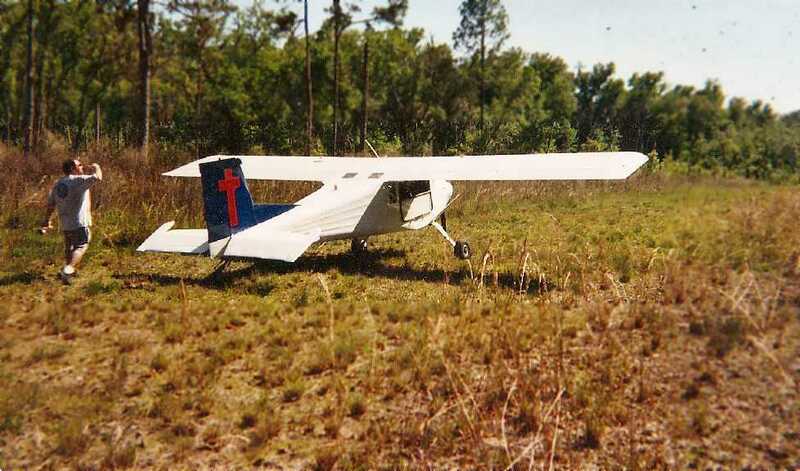 Sonny Hartley reported in 2007, “I had occasion to visit Osceola Airfield. Yes, it is a [landfill]. A 2016 aerial view looking north shows the Osceola Field site remains recognizable as a former airfield.